Like views of the change to a multiparty democracy, enthusiasm for the move from a state-controlled to a market economy has declined considerably in Lithuania, Russia and Ukraine over the past two decades. 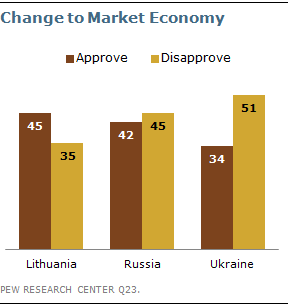 Of the three former Soviet republics surveyed, only in Lithuania do more approve than disapprove of the economic changes their country has undergone. Ukrainians, Lithuanians and Russians remain dissatisfied with national conditions; solid majorities in the three countries, especially in Ukraine and Lithuania, express discontent with the way things are going in their country and describe current economic conditions as poor. And few expect the economy to improve in the coming year. Fewer than half in the three former Soviet republics surveyed approve of their country’s move from a state-controlled to a market economy. In Lithuania, somewhat more approve (45%) than disapprove (35%) of the changes, while Russians are nearly evenly divided (42% approve and 45% disapprove) and Ukrainians offer mostly negative assessments (34% approve vs. 51% disapprove). 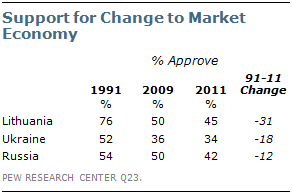 Support for the move to a market economy has declined markedly since 1991, and this is especially the case in Lithuania and Ukraine. Two decades ago, about three-quarters (76%) of Lithuanians and a narrower majority of Ukrainians (52%) and Russians (54%) approved of the move to capitalism. 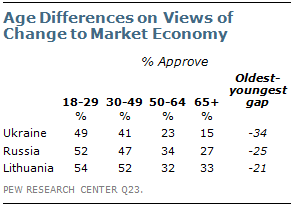 In Lithuania and Russia, opinions about the change to a market economy are somewhat more negative than they were just two years ago, when half in each country approved of the move to capitalism. Negative assessments of the move from a state-controlled to a market economy reflect, at least in part, the perception that most people are worse off financially than they were under communism. A fall 2009 survey found that a majority of Ukrainians (62%) and pluralities in Lithuania (48%) and Russia (45%) shared this view. The fall 2009 survey also found that Russians, Ukrainians and Lithuanians are less enthusiastic about the economic changes than are publics in many Eastern European countries; in that survey, at least two-thirds in the former East Germany (82%), Czech Republic (79%), Poland (71%) and Slovakia (66%) said they approved of the move to a market economy. As in the case of attitudes toward the move toward democracy, in the three former Soviet republics surveyed, opinions about the move to capitalism vary across age groups, with those younger than age 50 expressing far more enthusiasm than older generations. This gap is especially pronounced in Ukraine, where roughly half of those younger than 30 (49%) and 41% of those ages 30 to 49 approve of the changes, compared with 23% of 50-to-64 year-olds and just 15% of those ages 65 and older. A similar pattern is evident in Russia and Lithuania. Views of economic changes also vary somewhat by educational attainment; in the three countries, those with a college degree are more likely than those with less education to approve of the move to capitalism. This gap is most notable in Russia, where a narrow majority (52%) of college graduates approves of the changes, compared with 39% of those who did not graduate from college. In Lithuania, men are more enthusiastic than women about the move from a state-controlled to a market economy; 49% of men and 41% of women approve. No notable gender differences emerge in Russia or Ukraine. As has been the case in recent years, majorities in the former Soviet republics are unhappy with their country’s direction. At least eight-in-ten Ukrainians (87%) and Lithuanians (81%) are dissatisfied with the way things are going in their country; six-in-ten Russians also express discontent. Similarly, about nine-in-ten in Ukraine (92%) and Lithuania (90%), and 65% in Russia, describe the current economic conditions in their country as poor, virtually unchanged from recent years. Looking ahead, Ukrainians are the most pessimistic about their country’s economic prospects; 44% believe the economy will worsen over the next 12 months, while 36% think it will remain the same and just 15% say it will improve. In Russia and Lithuania, pluralities expect economic conditions to remain the same in the coming year (46% and 43%, respectively); but while more in Russia believe things will improve (28%) than say they will worsen (18%), the opposite is true in Lithuania, where 31% expect their country’s economy to worsen and 21% say it will improve.